Adoptive cell therapy with tumor-infiltrating lymphocytes (TILs) represents an effective treatment for patients with metastatic melanoma. However, most of the Ag targets recognized by effective melanoma-reactive TILs remain elusive. In this study, patient 2369 experienced a complete response, including regressions of bulky liver tumor masses, ongoing beyond 7 y following adoptive TIL transfer. The screening of a cDNA library generated from the autologous melanoma cell line resulted in the isolation of a mutated protein phosphatase 1, regulatory (inhibitor) subunit 3B (PPP1R3B) gene product. The mutated PPP1R3B peptide represents the immunodominant epitope recognized by tumor-reactive T cells in TIL 2369. Five years following adoptive transfer, peripheral blood T lymphocytes obtained from patient 2369 recognized the mutated PPP1R3B epitope. These results demonstrate that adoptive T cell therapy targeting a tumor-specific Ag can mediate long-term survival for a patient with metastatic melanoma. This study also provides an impetus to develop personalized immunotherapy targeting tumor-specific, mutated Ags. Patients with metastatic melanoma have a poor prognosis, as the five-year survival rate in this population is ∼5% (1). Other than the conventional chemotherapy, the available treatments include IL-2, anti–CTLA-4 Ab ipilimumab, BRAF V600E inhibitor vemurafenib, and adoptive cell therapy. Among these treatments, adoptive cell therapy can be an effective salvage treatment, after patients have progressed after other therapies (2). Adoptive cell therapy involves the transfer of autologous T cells with antitumor activity to the cancer-bearing patient. Tumor-infiltrating lymphocytes (TILs) within surgically resected melanoma deposits can be grown to large numbers in culture medium containing IL-2, while retaining reactivity against autologous tumor. On three sequential clinical trials, patients were treated with the adoptive transfer of autologous TILs after ex vivo expansion in conjunction with high-dose IL-2 following a lymphodepleting preparative regimen (3). Adoptive TIL transfer mediated the objective regression of metastatic melanoma in up to 72% of patients, including the induction of up to 36% of complete durable responses ongoing beyond 5 y (4). The results of studies have indicated that immunosuppressive factors present in the tumor microenvironment may restrain the in vivo activity of TILs (5, 6). The ex vivo culture of TILs with the stimulation of IL-2 can reverse this inhibitory state, resulting in their activation and clonal expansion. Despite the strong antitumor activities of TILs ex vivo, the majority of patients receiving adoptive TIL transfer have not experienced durable regressions. One potential explanation for these findings is that TIL-targeting Ags derived from essential genes may mediate long-term regression more effectively than those targeting nonessential gene products that can be downregulated, leading to tumor escape (7). However, most of the Ags recognized by adoptive transferred TILs that mediated long-term complete regressions remain elusive (8). To further examine this hypothesis, we identified the immunodominant target of a TIL product that was administered to a patient with metastatic melanoma who experienced a durable complete regression without tumor recurrence. All patient materials were obtained in the course of a National Cancer Institute Institutional Review Board–approved clinical trial. Patient 2369 was enrolled in a clinical trial (trial registration identification: NCT00096382, htttp://www.clinicaltrials.gov) that has been described in detail previously (9). The patient underwent a resection from which both a TIL line and a tumor cell line were established. TILs used for this study were generated by methods described previously (10). Briefly, tumor fragments were excised and cultured in media containing IL-2. TIL cultures that expanded were screened for recognition of autologous or HLA-matched tumor, and reactive TILs were expanded using a rapid expansion protocol (REP) with IL-2, anti-CD3 Ab, and irradiated feeder cells to large numbers for patient infusion (11). A small portion of TILs underwent a second REP for the experiments shown in this report. For coculture assays, T cells and tumor cells were cultured at a 1:1 ratio in a 96-well plate with 200 μl medium (AIM-V medium supplemented with 5% human serum) for 16 h. Cells from patient 2369 expressed the HLA-A*01, A*26, B*7, B*14, C*07, and C*08 class I alleles. In Ab-blocking experiments, melanoma cells were preincubated with HLA-B,C (B1.23.1) or HLA-A,B,C (W6/32) blocking Abs (40 μg/ml) for 3 h, followed by coculturing with T cells. The concentration of IFN-γ in the supernatant was determined by ELISA (Thermo Scientific). A cDNA library was generated from Mel 2369 mRNA using the SMARTer RACE cDNA Amplification Kit (Clontech), and the cDNA library was cloned into pCMV6 vector using the In-Fusion Advantage PCR Cloning Kit (Clontech), according to the manufacturer’s instructions. The following primer sets were used for PCR amplification: 5′-CAT GAT GGC TGT GGA CAT CGA GTA C-3′ and 5′-GTG AGC AGA GCT AGG CTT GTC TGT G-3′ for the amplification of protein phosphatase 1, regulatory (inhibitor) subunit 3B (PPP1R3B) open reading frame in Exon 2 from genomic DNA; 5′-TGC CCT CGG GAC TTA TGA GCT GAA C-3′ and 5′-GGC TTC CGA ACT GGT CAA AGG ATA T-3′ for the amplification of PPP1R3B transcription variant 1 from melanoma cDNA; and 5′-GCG GCC CAA AAG CCT GTT CAT CTA G-3′ and 5′-GGC TTC CGA ACT GGT CAA AGG ATA T-3′ for the amplification of PPP1R3B transcription variant 2 from melanoma cDNA. For PPP1R3B transcription variant 1 quantitative PCR, the following primer sets and probe were used: 5′-CCT CGG GAC TTA TGA GCT GAA-3′, 5′-GAG CCA TGC AGT TGT ATC TGT ACT C-3′, and probe 5′-ATC TAG CCC CAT GAT GGC TGT GGA CAT-3′. For PPP1R3B transcription variant 2 quantitative PCR, the following primer sets and probe were used: 5′-CGG CCC AAA AGC CTG TT-3′, 5′-GAG CCA TGC AGT TGT ATC TGT ACT C-3′, and probe 5′-ATC TAG CCC CAT GAT GGC TGT GGA CAT-3′. The method for TCR clonotype analysis has been described previously (12). For small interfering RNA (siRNA) knockdown assays, melanoma cells were transfected with siRNA and Lipofectamine RNAiMAX (Life Technologies) for 48 h, according to the manufacturer’s instruction. ON-TARGETplus siRNAs and nontargeting siRNA control were purchased from Dharmacon (Lafayette, CO). The following siRNAs were used: HLA-A1 (5′-CUG UGU UCG UGU AGG CAU A-3′); PPP1R3B (1) (5′-GCA GAU UAC UUA GAC UUU A-3′); PPP1R3B (2) (5′-GGC AAG AAC UAU AGG AUC A-3′); and PPP1R3B (3) (5′-GGA CAC UUA UGC CGG UUC A-3′). Expression plasmids were introduced into melanoma cells using the Neon transfection system (Life Technologies), according to the manufacturer’s instructions. Analysis of intracellular IFN-γ staining was carried out by pulsing 293-A1 cells with 10 μM peptide for 2 h, followed by a coculture with T cells for 4 h in the presence of GolgiPlug (BD Biosciences, San Jose, CA). Cells were then fixed, permeabilized, and stained according to the manufacturer’s instructions (eBioscience, San Diego, CA). The following Abs were used for flow cytometry analysis: anti–IFN-γ Ab (BD Biosciences), anti-TCR Vβ Abs (Beckman Coulter, Brea, CA), anti–HLA-A1, and A26 Ab (One Lambda, Canoga Park, CA). 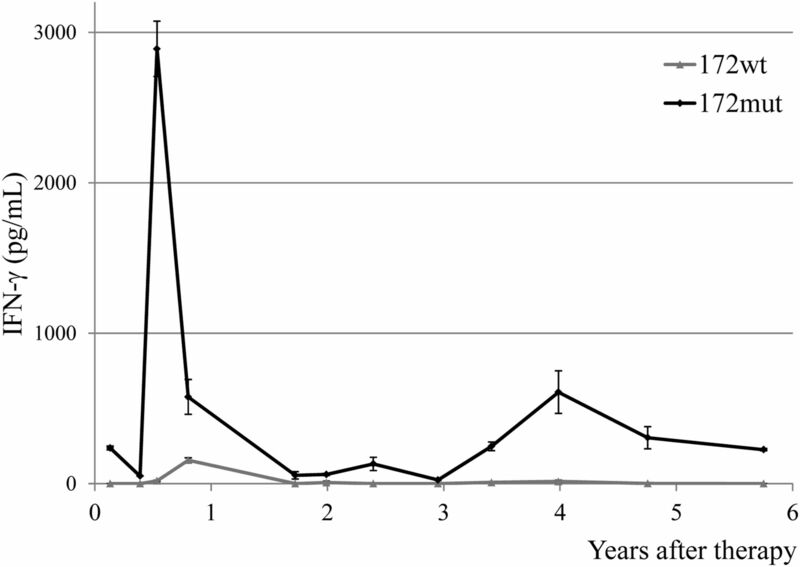 To measure CTL killing activity, a standard method was used as described previously (13). Briefly, target cells were pulsed with [51Cr]solution (0.1 mCi/ml) with or without peptides (10 μM) for 2 h. After washing, target cells were cocultured with effector cells at various ratios for 4 h, followed by the measurement of [51Cr]release. A standard protocol was followed to measure the binding affinity of short peptides to HLA molecules (14). Briefly, autologous EBV-transformed B cells were treated with acid to remove HLA-bound peptides, followed by an incubation for 24 h at 4°C with a fluorescent reference peptide Fl-A1, together with various concentrations of test peptides. The cells were then subjected to flow cytometric analysis, and the percentage of inhibition of fluorescent peptide was calculated. The following peptides were synthesized from a commercial source: Fl-A1 [YLEPAC(Fl)AKY], A*01 consensus sequence Ctrl-A1 (YLEPAIAKY) (IC50 = 200 nM), PPP1R3B 172wt (YTDFPCQYVK), and PPP1R3B 172mut (YTDFHCQYVK) (Atlantic Peptides, ME). Evaluation of peptide binding was also carried out using the REVEAL MHC binding assay, performed by ProImmune (Oxford, U.K.). Briefly, the assay measures the relative affinity of binding between a peptide to an HLA molecule by its ability to stabilize a peptide–MHC complex. Renatured peptide–MHC complexes were detected using an anti-MHC Ab that binds to native MHC molecules. Patient 2369 had metastatic melanoma with a primary lesion in the neck and metastatic lesions in the liver, brain, and periportal lymph node. In September 2004, he underwent a left lateral segmentectomy of the liver (segments 2 and 3), and TILs were grown from the liver metastasis (Fig. 1A). He received high-dose IL-2 therapy but developed a new brain metastasis, which was resected, while the largest lesion, present in segment 4 of the liver, continued to progress up until July 2005 (Fig. 1B). At that time, the patient was treated with adoptive cell transfer with TILs plus high-dose IL-2 following a lymphodepleting regimen, which resulted in the complete regression of the liver lesion. A stable periportal lymph node that was resected 7 mo after the adoptive cell therapy contained no viable tumor on pathological examination. This patient was declared a complete responder and remains free of disease 7 y following the treatment. None of the computed tomography and magnetic resonance imaging scans showed abnormalities consistent with melanoma in the last 5 y (Fig. 1C). Response of patient 2369 after adoptive cell therapy. 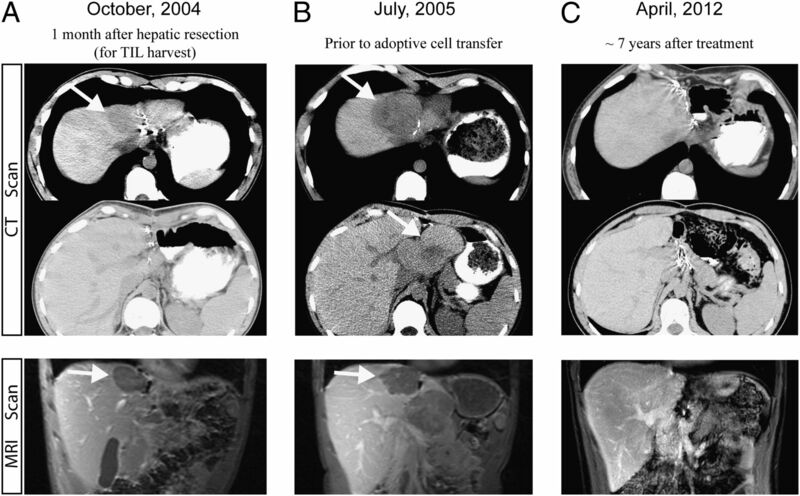 Computed tomography (CT) and magnetic resonance imaging (MRI) scans showed the disease status after the hepatic resection for TIL harvest (A), prior to the treatment (B), and 7 y after the adoptive cell therapy (C). White arrows indicate the lesions. To obtain sufficient cells for experiments in this study, the infused TIL 2369 T cells were further expanded in vitro using an REP. To examine the TCR repertoire before and after the REP, TCR clonotype analysis was performed with deep sequencing. As shown in Supplemental Table I, the majority of TCR clonotypes, including the most highly represented BV27 clonotype (Vβ14), were comparable in the original and in vitro expanded TIL samples. Experiments were then carried out to identify the predominant Ag target recognized by TIL 2369. The HLA loci of patient 2369 are A*01, A*26, B*07, B*14, Cw07, and Cw08. 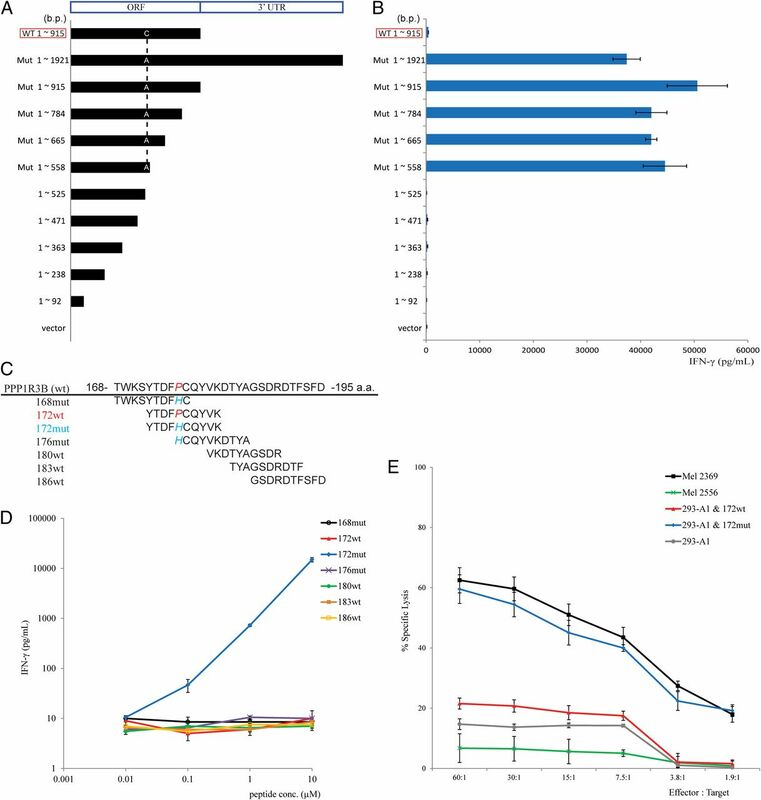 The ability of autologous Mel 2369 tumor cells to stimulate IFN-γ release from TIL 2369 T cells was not inhibited by incubation with a blocking Ab that binds to all HLA-B and C loci, indicating that TIL 2369 predominantly recognized the autologous melanoma in the context of HLA-A*01 or A*26 (Fig. 2A). Mel 2369 cells transfected with an siRNA targeting the HLA-A*01 3′-untranslated region stimulated lower levels of IFN-γ release from TIL 2369 T cells than the cells transfected with a nontargeting siRNA (Fig. 2B, 2C). In addition, transfection of tumor cells with an HLA-A*01 cDNA lacking the natural 3′-untranslated region interfered with the ability of the HLA-A*01–specific siRNA to inhibit the recognition of the Mel 2369 by autologous TIL (Fig. 2B, 2C). These results indicate that TIL 2369 predominantly recognized the autologous tumor cells in the context of HLA-A*01. Identification of dominant HLA-restriction element of TIL 2369 T cells. 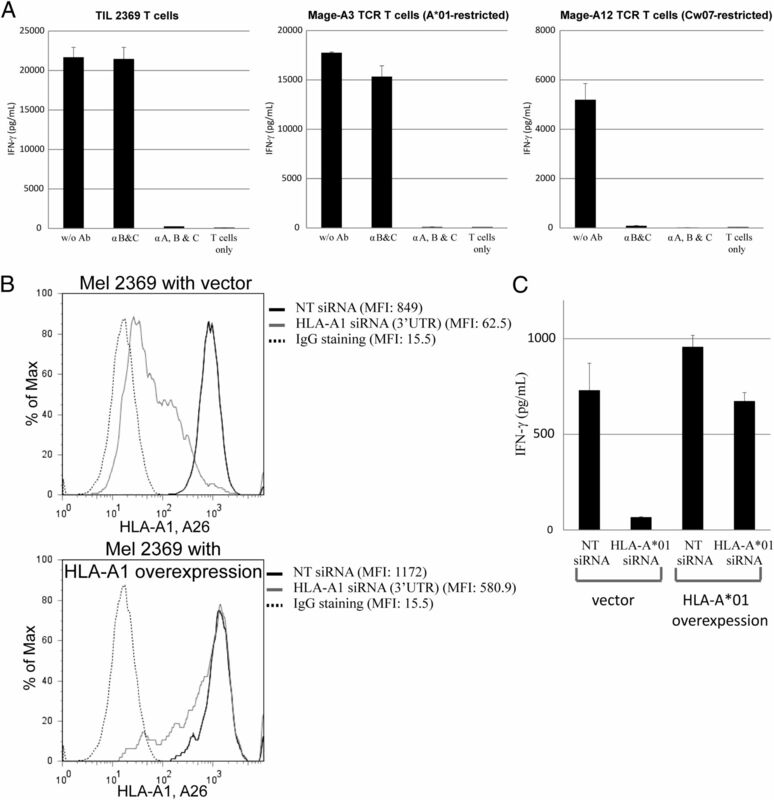 (A) Mel 2369 cells were preincubated with HLA-B,C (B1.23.1) or HLA-A,B,C (W6/32) blocking Abs for 3 h, followed by coculturing with TIL 2369 T cells, Mage-A3 TCR-transduced, or Mage-A12 TCR-transduced T cells overnight. (B) Mel 2369 cells were transfected with HLA-A*01 siRNA and cDNA, and the expression of HLA-A1 and A26 was determined by flow cytometry (nontargeting [NT]). (C) Mel 2369 cells were transfected with HLA-A*01 siRNA and cDNA and then cocultured with autologous TIL 2369 T cells. The secretion of IFN-γ by T cells was determined by ELISA. TIL 2369 T cells did not appear to recognize any of a large panel of previously described shared melanoma Ag targets that were evaluated for recognition in association with autologous HLA alleles (Supplemental Fig. 1). Identification of the Ag recognized by TIL 2369 T cells was carried out by the transient transfection of HLA-A*01–expressing HEK293 cells (293-A1 cells) with pools of 50 cDNA clones generated from the autologous melanoma 2369. These transfected cells were cocultured with TIL 2369 T cells overnight, and the secretion of IFN-γ was detected by ELISA (Fig. 3A). After screening ∼1000 cDNA library pools, a single-positive pool was identified and confirmed. All of the positive clones isolated from this pool corresponded to the transcript of the PPP1R3B gene. According to the GenBank database, alternate splicing of PPP1R3B results in two transcript variants, which encode the same protein. The sequence of the PPP1R3B coding region was identical to sequences in the GenBank database, with a single C to A transversion at 527 bp, which resulted in a substitution of histidine for proline at position 176 of the wild-type (WT) PPP1R3B protein (Fig. 3B). 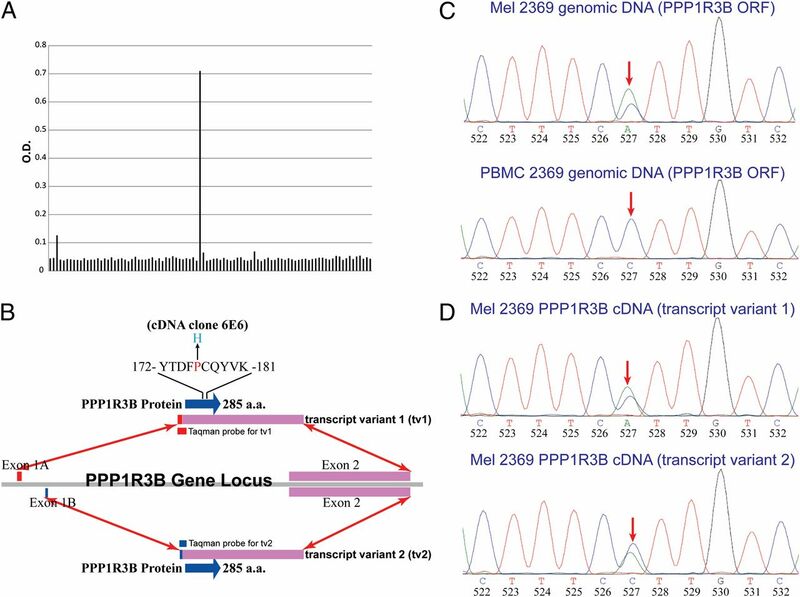 Exon 2 of PPP1R3B, which encodes the entire protein, was amplified from genomic DNA isolated from both the Mel 2369 and the PBMCs from patient 2369 (Fig. 3C). Genomic DNA and cDNA amplified from Mel 2369 cells contained both the mutated and WT nucleotide at position 527 in the PPP1R3B coding region, whereas DNA isolated from the PBMC of patient 2369 appeared to correspond exclusively to the WT sequence, indicating that this represented a somatic mutation in Mel 2369 cells. The sequences of the two PPP1R3B transcript variants amplified from Mel 2369 cDNA contained the mutated as well as the WT nucleotide at position 527 (Fig. 3D). Identification of mutated PPP1R3B as the potential Ag. (A) cDNA library screening of the potential Ag. A single colony containing a mutated PPP1R3B cDNA fragment was isolated from a pool of 50 colonies. (B) Gene structure of PPP1R3B. Both transcripts encode the same protein. (C) DNA sequence chromatogram results for PPP1R3B genomic DNA obtained from autologous PBMC and Mel 2369 cells. (D) DNA sequence chromatogram results for PPP1R3B cDNA obtained from autologous Mel 2369 cells. ORF, Open reading frame. Exomic sequence analysis of DNA isolated from 14 additional melanoma cell lines revealed that although this residue was not mutated in other melanoma cells, one additional melanoma cell line contained a nonsynonymous mutation in the PPP1R3B gene (15). The DNA from Mel 2167 cell line contained a C to T transition, resulting in a substitution of Phe for the Ser residue at amino acid position 16 of the WT PPP1R3B protein. PP1 represents a eukaryotic protein serine/threonine phosphatase that is comprised of 1 catalytic subunit (PP1c) and 1 of the >50 regulatory subunits. The regulatory subunits, which include PPP1R3B, define the substrate specificity, subcellular location, and functional diversity of the PP1 complex (16). Previous studies have demonstrated that PP1c, together with the regulatory subunit PPP1R3 family, plays an important role in glycogen metabolism (16). For instance, the expression of PPP1R3B in liver cells is upregulated in response to insulin stimulation. The PP1 protein complex (PP1c–PPP1R3B) dephosphorylates glycogen synthase, thereby enhancing its activity through an allosteric mechanism (17–19). PPP1R3B transcript variant 1 was highly expressed in human liver, consistent with the previous reports (Supplemental Fig. 2A) (18, 20). However, PPP1R3B transcript variant 2 was expressed at high levels in a variety of human tissues, including placenta, leukocytes, prostate and spleen (Supplemental Fig. 2A), which has not been reported previously. Both transcript variants of PPP1R3B were also expressed at variable levels in 9 out of the 11 melanoma cell lines that were evaluated (Supplemental Fig. 2B). The relationship between glycogen metabolism and carcinogenesis remains largely unclear. Studies showed that the glycogen level was higher in tumor compared to the adjacent or normal tissue, and the glycogen level was negatively correlated with the tumor cell proliferation rate (21–23). Recent studies also demonstrated that hypoxia could induce the accumulation of glycogen, but the detailed molecular mechanism is still unknown (24, 25). In this study, the PPP1R3B mutation found in Mel 2369 (Fig. 3B) was located within the proposed glycogen binding domain of PPP1R3B protein (26). Although nonsynonymous PPP1R3B mutations appear to be infrequently observed in melanoma, many nonsynonymous mutations have been identified among the PPP1R3 family, indicating that mutations in the members of this gene family may play a role in carcinogenesis (15, 27, 28). To further demonstrate that the mutated PPP1R3B represents a naturally processed tumor Ag recognized by TIL 2369 T cells, Mel 2369 cells were transfected with PPP1R3B siRNAs, which led to reduced expression of both PPP1R3B transcript variants (Fig. 4A). Transfection of Mel 2369 cells with PPP1R3B siRNAs significantly inhibited the ability to stimulate IFN-γ release from TIL 2369, but did not alter the responses of control HLA-A*01–restricted MAGE-A3–specific T cells (Fig. 4B). In addition, COS-7 cells were transfected with either WT or mutated PPP1R3B cDNA, together with HLA-A*01, HLA-A*02, or HLA-A*26 cDNA. TIL 2369 T cells only recognized cells with the mutated but not WT PPP1R3B gene product in HLA-A*01 (Fig. 4C). Taken together, these results indicated that a mutated product of the PPP1R3B gene represented an immunodominant target of TIL 2369 T cells. TIL 2369 T cells recognize mutated, but not WT, PPP1R3B gene product. (A) PPP1R3B mRNA expression in melanoma cell lines after the transfection of Mel 2369 cells with PPP1R3B siRNAs. The copy numbers of PPP1R3B transcript variant 1 and variant 2 from Mel 2369 cells after siRNA transfection were determined by quantitative PCR (nontargeting [NT]). (B) Mel 2369 cells were transfected with PPP1R3B siRNAs and then cocultured with TIL 2369 T cells or HLA-A*01–restricted Mage-A3 TCR-transduced T cells. (C) COS-7 cells were transfected with HLA cDNA constructs, together with WT or mutated PPP1R3B cDNA construct. These transfected cells were cocultured with TIL 2369 T cells overnight. The secretion of IFN-γ was determined by ELISA. 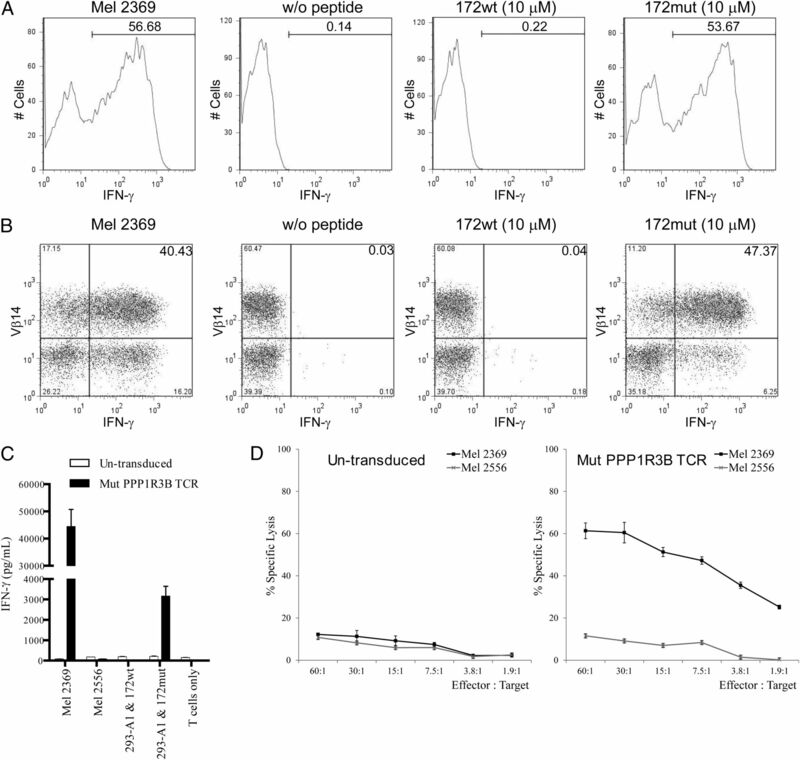 The region of the mutated PPP1R3B transcript that encoded the T cell epitope was determined by transfection of 293-A1 cells with constructs encoding C-terminal truncations of the mutated PPP1R3B protein (Fig. 5A), followed by the coculture with TIL 2369 T cells. The result indicates that the T cell epitope mapped to the region between aa 175 and 186 (cDNA 525–558 bp), which included the mutated amino acid (176 aa) of PPP1R3B (Fig. 5B). An HLA peptide binding prediction program was used to identify candidate HLA-A*01–binding peptides encompassed by residues 175–186, which were then synthesized and tested for their ability to be recognized by TIL 2369 (Fig. 5C) (29). 293-A1 cells were pulsed with this set of peptides and then cocultured with TIL 2369 T cells. The results demonstrate that cells pulsed with a decamer corresponding to residues 172–181 (172mut) stimulated the release of high levels of IFN-γ from TIL 2369 T cells, and the peptide was recognized at a minimum concentration of 0.1 μM. In contrast, the corresponding WT peptide did not induce significant IFN-γ release at a concentration as high as 10 μM (Fig. 5D). Consistent with IFN-γ ELISA results, TIL 2369 T cells specifically lysed Mel 2369 cells as well as 293-A1 cells that were pulsed with 172mut peptide (Fig. 5E). Identification of the PPP1R3B epitope. (A) Constructs encoding the truncations of the C terminus of the mutated PPP1R3B. (B) 293-A1 cells were transfected with these constructs, followed by coculturing with TIL 2369 T cells. The secretion of IFN-γ was determined by ELISA. (C) Multiple peptides covering the region of 175–186 aa were synthesized. (D) 293-A1 cells were pulsed with these peptides, followed by coculturing with TIL 2369 T cells. (E) Target cells, including melanoma cells or 293-A1 cells pulsed with 172wt or 172mut peptide, were incubated with TIL 2369 T cells in a [51Cr]release assay. HLA-A*01+ Mel 2556 cells lack the PPP1R3B mutation. ORF, Open reading frame; UTR, untranslated region. Assays were then carried out to evaluate the relative HLA-A*01 binding affinities of 172wt and 172mut peptides. In a competition-based cellular peptide binding assay for HLA-A*01, both 172wt and 172mut inhibited binding of the fluorescent peptides at a 2- to 3-fold lower concentration than the unlabeled control peptide (Supplemental Fig. 3A). Additionally, the results of a REVEAL MHC–peptide binding assay suggest that both 172wt and 172mut are good binders (Supplemental Fig. 3B). These results demonstrate that both of the PPP1R3B 172wt and 172mut peptides represent relatively strong binders that have similar affinities for HLA-A*01. These results indicate that the mutated residue at position 5 in the 172mut peptide does not play a major role in MHC binding, because the anchor residues at positions two and three as well as the C terminus were not altered. The Ag reactivity of TIL 2369 T cells was then further evaluated by intracellular IFN-γ staining after coculture with the target cells. As shown in Fig. 6A, nearly 50% of TIL 2369 T cells upregulated IFN-γ in response to Mel 2369 cells. This result indicates that around half of the TIL 2369 T cells recognized Mel 2369 cells, but most of the additional T cells either were inactive or did not recognize autologous melanoma cells. The percentage of TIL 2369 T cells that recognized 293-A1 cells pulsed with PPP1R3B 172mut peptide was similar to that observed in response to autologous tumor cells, suggesting that 172mut represents the immunodominant epitope recognized by TIL 2369. Furthermore, the majority of cells upregulating IFN-γ+ in response to autologous tumor cells, as well as cells pulsed with the mutated PPP1R3B peptide, expressed Vβ14 (Fig. 6B). Cells expressing a single rearranged Vβ14 sequence represented the dominant T cell clonotype in TIL 2369, based on the Ab staining and TCR clonotype analysis (Supplemental Table I). The cDNA encoding the TCR from this dominant T cell population was then isolated, and activated T cells obtained from the peripheral blood of healthy donors were transduced with a recombinant retroviral construct encoding this dominant TCR. The T cells transduced with this TCR recognized Mel 2369 cells, as well as 293-A1 cells pulsed with PPP1R3B 172mut peptide, but not the corresponding WT peptide (Fig. 6C). In addition, TCR-transduced T cells could kill Mel 2369 cells but not Mel 2556 cells, an HLA-A*01+ melanoma that lacks the PPP1R3B mutation (Fig. 6D). Taken together, these results suggest that the majority of autologous tumor-reactive T cells in TIL 2369 recognize the mutated PPP1R3B Ag. Mutated PPP1R3B-reactive T cells are responsible for tumor recognition. Intracellular IFN-γ staining (A) and TCR Vβ14 costaining (B) of TIL 2369 T cells after coculture with autologous Mel 2369 cells or 293-A1 cells pulsed with PPP1R3B 172wt or 172mut peptide. (C) Healthy donor T cells were transduced with mut PPP1R3B TCR. These T cells were cocultured with Mel 2369, Mel 2556 (HLA-A*01+), or 293-A1 cells pulsed with PPP1R3B 172wt or 172mut peptide. (D) In a [51Cr] release assay, healthy donor T cells transduced with mut PPP1R3B TCR or untransduced T cells were incubated with autologous Mel 2369 cells or Mel 2556 cells. Immune surveillance plays a significant role in host defense against pathogens and may also play a role in limiting or preventing tumor recurrence. To examine the potential role of T cell reactivity against mutated PPP1R3B epitope in the long-term clinical response observed in patient 2369, PBMCs obtained from this patient following adoptive transfer were analyzed for their ability to secrete IFN-γ after the stimulation with PPP1R3B 172mut peptide. As shown in Fig. 7, the PBMCs obtained >5 y following treatment generated significant levels of IFN-γ in response to the mutant but not the WT PPP1R3B peptide. This result provides evidence for long-term persistence of adoptively transferred T cells that recognize this mutated epitope and suggests that they may have played a role in the complete tumor regression that was observed in this individual. The long-term persistence of mutated PPP1R3B-reactive T cells. Patient 2369 PBMC samples were thawed and incubated overnight in medium with IL-2, followed by stimulation with PPP1R3B 172wt or 172mut peptides. The secretion of IFN-γ was determined by ELISA after overnight culture. In this study, we identified a dominant T cell population, which is responsible for the majority of Mel 2369-reactive T cells within TIL 2369. Importantly, TIL 2369 recognized a mutated PPP1R3B epitope, but not the corresponding WT peptide. This is consistent with the observation that adoptive cell therapy using this TIL product did not induce severe toxicity in patient 2369. In some cases, mutated epitopes, but not the corresponding WT peptides, have been shown to bind to the MHC molecules. However, this is only true when the point mutations occur at the anchor residues of the epitopes, which can dramatically change the binding affinity of the epitopes (30). The PPP1R3B mutation identified from Mel 2369 does not represent an anchor residue, however, as the PPP1R3B 172wt and 172mut peptides represent relatively high affinity HLA-A*01-binding peptides. The amino acids altered by mutation may influence Ag processing, including proteasomal cleavage and TAP-mediated transport; however, this is generally true only for C-terminal residues. More likely, the mutated amino acid in PPP1R3B represents a TCR contact residue, and the specificity of TCR may contribute to the recognition of this neo-Ag. Negative selection in the thymus presumably resulted in deletion of T cells that recognize the WT PPP1R3B peptide. It has been proposed that the immune system controls tumor growth and shapes tumor immunogenicity, a process named cancer immunoediting, which has been proposed to comprise three phases: elimination, equilibrium, and escape (7). Recent murine studies illustrated that mutated as well as foreign Ags present in tumors isolated from immunodeficient mice are responsible for the rejection of these tumors when transplanted into immunocompetent mice in the elimination phase (30, 31). Subsequently, rare variants of tumors that can outgrow in immunocompetent mice generally have lost or downregulated expression of these dominant tumor rejection Ags in the escape phase. Although the immunoediting process has primarily been demonstrated in murine models, human studies also suggest that immunotherapy can lead to a loss of HLA or Ag expression on tumors that recur following initial regression, indicating that immunoediting may result from effective in vivo antitumor immune responses (32, 33). In contrast to these observations, the tumor in patient 2369 failed to recur following initial regression. In addition, T cells recognizing mutated PPP1R3B epitope persist beyond 5 y. To explain the disappearance of the tumor and the long-term persistence of these T cells, one possibility is that low levels of tumor cells persist for several years following treatment but fail to be detected in the patient. Tumor cells that continue to express the mutated PPP1R3B Ag can then be recognized by T cells, resulting in the establishment of an equilibrium between tumor and T cells. The alternative hypothesis is that T cells that have killed the last tumor cell do not encounter this mutated Ag for several years but are maintained through Ag-independent mechanisms. However, it has not been clearly established whether the maintenance of T cell memory is necessarily dependent on constitutive stimulation by cognate Ag (34, 35). Further studies are needed to understand the detailed mechanisms that govern interactions between the immune system and tumors in humans. A recent study demonstrated that melanoma cells stimulated with TNF-α were poorly recognized by T cells specific for melanocyte differentiation Ags due to the inflammation-induced reversible dedifferentiation (36). This is consistent with our hypothesis in this study that adoptive cell therapy targeting nonessential, melanocyte differentiation Ags is likely less effective than targeting essential, tumor-specific Ags. The results presented in this study provide the most direct evidence to date that targeting a tumor-specific, mutated Ag in an adoptive cell therapy could mediate a complete, durable regression of a human cancer without recurrence 7 y following treatment. Mutated gene products, especially gene products that play essential roles in carcinogenesis, may represent particularly potent immunotherapy targets. The development of techniques that facilitate the identification of mutated tumor Ags may allow more effective tumor targeting and avoid the autoimmune toxicity observed in previous adoptive therapy protocols targeting tumor-associated Ags, which are also expressed in normal tissues (37). We are grateful to J.S. Crystal, M. Garcia, C. Gross, K. Hanada, Q.J. Wang, J.R. Wunderlich, Z. Zheng, and S. Zhu for technical support and suggestions. This work was supported by the Intramural Research Program of the National Cancer Institute, National Institutes of Health.
. 2009. Final version of 2009 AJCC melanoma staging and classification. J. Clin. Oncol. 27: 6199–6206. 2012. Raising the bar: the curative potential of human cancer immunotherapy. Sci. Transl. Med. 4: ps8.
. 2002. Cancer regression and autoimmunity in patients after clonal repopulation with antitumor lymphocytes. Science 298: 850–854.
. 2011. Durable complete responses in heavily pretreated patients with metastatic melanoma using T-cell transfer immunotherapy. Clin. Cancer Res. 17: 4550–4557.
. 2009. Tumor antigen-specific CD8 T cells infiltrating the tumor express high levels of PD-1 and are functionally impaired. Blood 114: 1537–1544.
. 2011. Exhaustion of tumor-specific CD8⁺ T cells in metastases from melanoma patients. J. Clin. Invest. 121: 2350–2360.
. 2002. Cancer immunoediting: from immunosurveillance to tumor escape. Nat. Immunol. 3: 991–998.
. 2012. Adoptive immunotherapy for cancer: harnessing the T cell response. Nat. Rev. Immunol. 12: 269–281.
. 2008. Adoptive cell therapy for patients with metastatic melanoma: evaluation of intensive myeloablative chemoradiation preparative regimens. J. Clin. Oncol. 26: 5233–5239.
. 2003. Generation of tumor-infiltrating lymphocyte cultures for use in adoptive transfer therapy for melanoma patients. J. Immunother. 26: 332–342.
. 1992. Restoration of viral immunity in immunodeficient humans by the adoptive transfer of T cell clones. Science 257: 238–241.
. 2004. T cell receptor recognition motifs govern immune escape patterns in acute SIV infection. Immunity 21: 793–803.
. 2006. Induction and measurement of cytotoxic T lymphocyte activity. Curr. Protoc. Immunol. Chapter 3: Unit 3 11.
. 2004. Competition-based cellular peptide binding assay for HLA class I. Curr. Protoc. Immunol. Chapter 18: Unit 18 12.
. 2011. Exome sequencing identifies GRIN2A as frequently mutated in melanoma. Nat. Genet. 43: 442–446. 2002. Protein phosphatase 1—targeted in many directions. J. Cell Sci. 115: 241–256.
. 1998. Loss of the hepatic glycogen-binding subunit (GL) of protein phosphatase 1 underlies deficient glycogen synthesis in insulin-dependent diabetic rats and in adrenalectomized starved rats. Biochem. J. 333: 253–257.
. 1995. Amino acid sequence and expression of the hepatic glycogen-binding (GL)-subunit of protein phosphatase-1. FEBS Lett. 375: 294–298.
. 2000. Distinctive regulatory and metabolic properties of glycogen-targeting subunits of protein phosphatase-1 (PTG, GL, GM/RGl) expressed in hepatocytes. J. Biol. Chem. 275: 26396–26403.
. 2002. Human skeletal muscle expresses a glycogen-targeting subunit of PP1 that is identical to the insulin-sensitive glycogen-targeting subunit G(L) of liver. Diabetes 51: 591–598.
. 1981. Presence of glycogen and growth-related variations in 58 cultured human tumor cell lines of various tissue origins. Cancer Res. 41: 1165–1170.
. 1989. Gastric cancer with special references to WHO and Laurén’s classifications: glycogen and triacylglycerol concentrations in the tumor. Neoplasma 36: 363–368.
. 1999. Estimation of glycogen levels in human colorectal cancer tissue: relationship with cell cycle and tumor outgrowth. J. Gastroenterol. 34: 474–480.
. 2010. Hypoxia promotes glycogen accumulation through hypoxia inducible factor (HIF)-mediated induction of glycogen synthase 1. PLoS ONE 5: e9644.
. 2010. Hypoxia-inducible factor 1-mediated regulation of PPP1R3C promotes glycogen accumulation in human MCF-7 cells under hypoxia. FEBS Lett. 584: 4366–4372.
. 1998. Identification of the separate domains in the hepatic glycogen-targeting subunit of protein phosphatase 1 that interact with phosphorylase a, glycogen and protein phosphatase 1. Biochem. J. 336: 699–704.
. 2012. Melanoma genome sequencing reveals frequent PREX2 mutations. Nature 485: 502–506.
. 2012. A landscape of driver mutations in melanoma. Cell 150: 251–263.
. 1994. Scheme for ranking potential HLA-A2 binding peptides based on independent binding of individual peptide side-chains. J. Immunol. 152: 163–175.
. 2012. Cancer exome analysis reveals a T-cell-dependent mechanism of cancer immunoediting. Nature 482: 400–404.
. 2012. Expression of tumour-specific antigens underlies cancer immunoediting. Nature 482: 405–409.
. 2003. Cell transfer therapy for cancer: lessons from sequential treatments of a patient with metastatic melanoma. J. Immunother. 26: 385–393.
. 2004. Identification of multiple antigens recognized by tumor-infiltrating lymphocytes from a single patient: tumor escape by antigen loss and loss of MHC expression. J. Immunother. 27: 184–190.
. 2005. The role of models in understanding CD8+ T-cell memory. Nat. Rev. Immunol. 5: 101–111.
. 2009. Diversity in T cell memory: an embarrassment of riches. Immunity 31: 859–871.
. 2012. Melanomas resist T-cell therapy through inflammation-induced reversible dedifferentiation. Nature 490: 412–416.
. 2009. Gene therapy with human and mouse T-cell receptors mediates cancer regression and targets normal tissues expressing cognate antigen. Blood 114: 535–546.